I’ve been a fan of the blog Atlantic-Pacific and Blair Eadie for a very long time. I love that she’s not afraid of color or prints. Based on her outfit choices that include a variety of color combinations and materials including tulle skirts, I get the impression that she believes fashion should be fun. When I heard she was coming out with a collaboration with Nordstrom, I was psyched. I knew it would be colorful and girly with some sporty pieces thrown in to balance the sweetness. Based on her background in merchandising working for both the Gap and Tory Burch, she knows what she is doing and it shows in the collection. I thought the quality was very good, and I’m happy with my purchases. What’s really great about the shoes in the collection is that if you fall in love with a shoe, but you don’t wear heels for example, each shoe is available in different heights and styles (mules, flats, boots and heels) and heel heights (flats and heels). I bought Georgiana Bow Pump in soft blue tweed with multicolored flecks that make the pair easy to pair with many items in my wardrobe and the Flatform Derby in navy pictured above. The Georgiana Bow Pump also comes in all black if you’re not a fan of tweed or color, and the Flatform Derby comes in blush and silver, which is a great neutral. I ordered a 7.5 in each and they both fit, so I would say that they run true to size. I wanted to get the silver flatform also but I have silver boots, so I was good and just went with the navy, which is not the easiest color to find in a shoe. In my opinion, the Derby Flatforms look best without socks or no show socks. 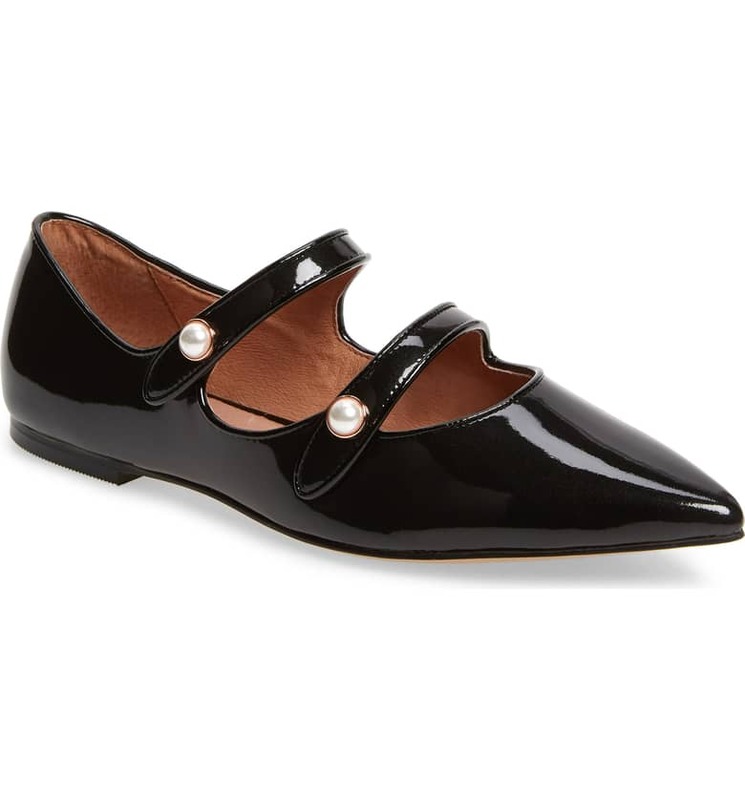 I also loved the Double Strap Flat with pearl buttons pictured below. They are available in soft blue tweed, black patent and rose glitter and the the Perfect Mule, which is also in soft blue tweed, black patent and rose glitter. All shoes mentioned above are pictured below. The glitter mule would be great for the holidays and the flats are commuter friendly. There are also pointy boots and slingback pumps in the collaboration that aren’t pictured . I’m still thinking about the glitter mules and flats and the silver flatforms, which usually means I will buy one of them. You can see me wearing the flatforms below. If you follow my Instagram, you can see I love color and prints. When I saw this top and skirt I knew that I wanted to add it to my wardrobe. I bought both in a size small. They are both a tad big. 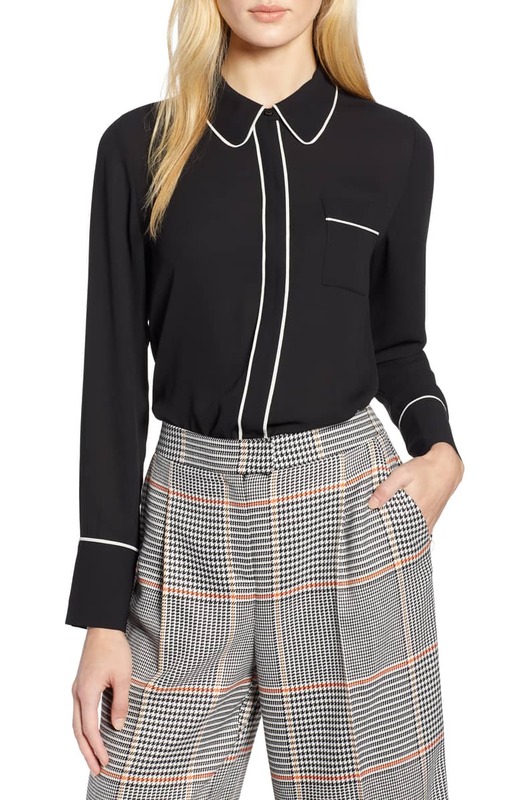 If I ordered the hidden placket blouse top in a XS, I would be afraid I wouldn’t be able to wear it untucked b/c it may be tight around my hips, so I’m keeping the small. As for the crinkle skirt, it’s lined and has an elastic waistband that’s very comfortable, but not the type that fits tight enough. It comes in petite that could help with length but I’m fine with the length. I could also order an XS, but I don’t think it would make a big enough difference because of the type of waistband used anyway. 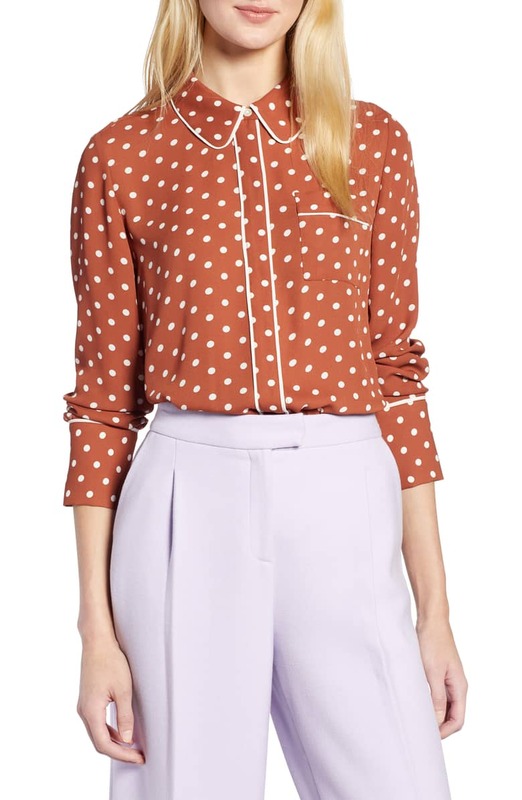 The top comes in rust with polka dots and black with white piping. 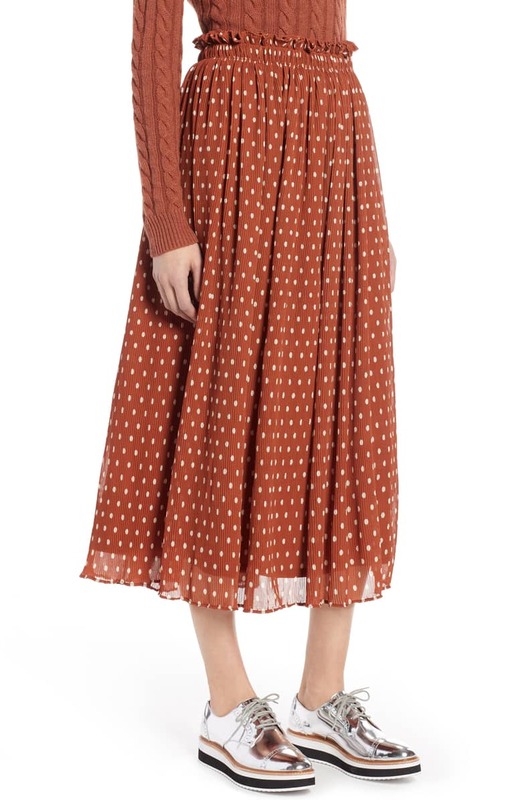 The skirt is available in rust with polka dots. You can make sets with the prints but the black top doesn’t have a matching skirt. The set is versatile because of the type material used and there are plenty of colors that I could pick up one and highlight it. I could also wear the skirt and top together or separately. In my opinion, It looks best with a belt. You can see Blair and I wearing the set below and all the pieces mentioned above as well as the tag that comes with each piece in the collection. I attached two videos that show the full collection and Blair’s suggestions for how to style the pieces.